1. The email could just be delayed reaching your inbox. Sometimes it might take just a short bit longer, so give it 30-60 minutes to give it a chance to come through if it hasn't. 3. Check Spam and Trash filters. Yeah, we know, it's like telling you to "make sure it's plugged in", but we all forget to check sometimes! 4. You may be unintentionally blocking Expensify emails because we aren't whitelisted. How to resolve? If you're using a private domain: Check with your IT person/department to ensure that expensify.com and amazonSES.com are both whitelisted to receive our emails. These are the email addresses that these types of notifications come from, so you'll want to check they're not being blocked. 5. Your email server may be blocking emails. There are a couple services that block our emails and flag them as spam, so you may also want to check with your IT department here too! 6. If your company uses Mimecast, this might be coming into play. Mimecast is a commonly used service that often affects the deliverability of our emails might be blocking them from hitting your inbox. Not sure if your company is using this service? Check with your IT department. If it is being used, try reaching out to us in a new email to concierge@expensify.com. We should be able to respond to this message easily, which will ensure delivery to your inbox. Mimecast will soon recognize the Expensify domain and our emails should no longer be filtered out. When you click the Settings link in the banner, you are taken to your account settings, where you may see one of a few different things. If the message mentions an "Email Suppression List Removal", please follow the steps listed in the yellow box. Basically, we can't find an inbox to send our emails to. This could be caused by a misspelled email address when you created your account, a distribution list email (with no actual inbox linked, and acting as an "alias" email), or if you have had an auto-responder responding to our emails for some time. Once you can confirm that the email address is indeed linked to an active inbox, then you can write into us at concierge@expensify.com or use the messenger bubble to help. Simply mention "Email Suppression List Removal" and we can clear this for you! These look a bit cryptic, yes, but hang in there! These error messages are the raw message text received from your email provider's server to Amazon. They can range in text, but the best bet is to follow the link (by copying and pasting) that is provided in the text for next steps. If the message in the gray box includes "mimecast.com" (like the screenshot above), you will want to speak to your IT person/team because our emails are being blocked by the server. If the message in the gray box mentions "blacklist at org/.com/.net,etc" or looks like the screenshot below, then it means your IT team has configured your email to use a third party email reputation/blacklisting service. All of our emails are SPF and DKIM signed, which means they are cryptographically signed as being from us, and are not spam. You'll likely want to talk to your IT team about this. 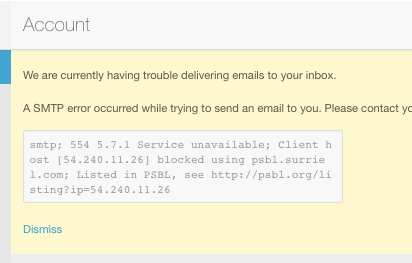 The issue here is that we're sending mail from a cloud-based service. This means that the IP of the sender services multiple vendors in addition to Expensify. If one of those vendors gets marked as spam, you're blocking all messages coming from that IP -- even if the messages are from completely different vendors (including us). Instead, the server should be flagging spam via DKIM and SPF (rather than the IP address of sender alone), as our messages are properly signed and encrypted to prevent spoofing. Still stuck? Use the messenger bubble in the lower right hand corner of your screen to give us a shout!